When we bought our house, the previous owners kindly left us a dehumidifier for the basement. It’s the small inexpensive kind, 30 pints capacity (whose bright idea was it to size dehumidifiers by pints?!) which fills up in some ridiculously short interval, that probably sells a lot of 70-pint models the 2nd time around. The problem is the collection tank. It jams easily against the side walls & fills up with water an inch from the top. Emptying without spilling half the water is an exercise in futility. …until today, when I realized that I’d acquired a 12V bilge pump, old garden hoses, a programmable timer, & an overflowing box of power adapters. See where this is headed? 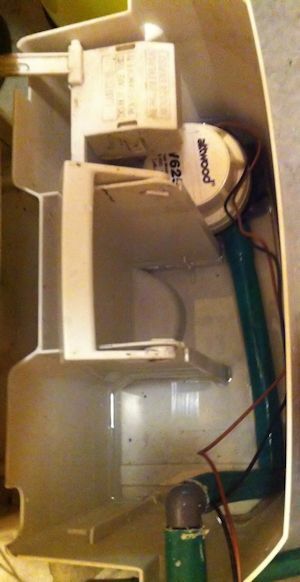 Put bilge pump in the dehumidifier tank. Drill holes for hose to pass out of the tank at the top above the cutoff water level, & through an outside wall. Or into a floor drain if you’re lucky enough to have one. Or you could have it empty directly into your grey water line if you’re feeling bravely plumber-ish, & the vertical run isn’t too much for the bilge pump — in that case, try a slower but far more powerful diaphragm water pump instead. Attach hose to the bilge pump & run it to wherever you ended up in step 2. 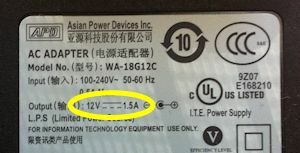 Find a 12-volt power adapter with an output amp rating sufficient to run the bilge pump — 1.5A for the Rule 360GPH linked below — and plug it into the timer. Set timer to run a few times a day for ~1-2 minutes each run. Total cost is ~$30 for the bilge pump & programmable timer. Everyone has old hose & 12V power adapters. Setup time is 1/2 hour. Have one less daily annoyance! Your life will never be the same. 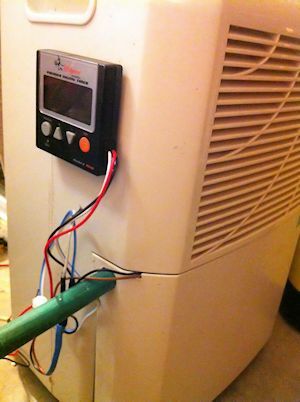 I used two PVC 1/2″ 90-degree elbows to help run the hose out of the dehumidifier collection tank. I used a 7/8″ spade bit for the holes, which worked great on the plastic tank — high speed, don’t push hard, just let it melt. I sealed the hose hole to the outside world with some outdoor-rated silicon sealant. An inline fuse on the positive wire to the bilge pump is a good idea. If you’re into the finished look for your wire splices, get some fancy-pants heat-shrink tubing. Your local hardware store has all this too. IMPORTANT NOTE: I found if my dehumidifier shut off from a full tank, the bilge pump draining the tank wouldn’t reset the warning. The only way to reset the “FULL” shutoff is to physically remove & replace the tank… sad defeat for my nifty self-draining system. The workaround is make sure the tank never gets full. There’s a popular Stanley-brand timer that only supports 1 event per day — but once-a-day draining might not be enough to keep the tank from filling up, so get a timer that supports multiple daily events like the GE-brand timer linked above. SOME PHOTOS: You’ll see I used a 12V timer since that’s what I had lying around (so it went between the power adapter & the bilge pump), but the better way is the 120VAC timer as described above. Simpler setup, fewer splices, better power consumption, etc. This is a fantastic idea. I am tired of draining the bucket twice a day. I brainstormed a little about how to do it, but but never came up with a solution. I am putting this on the top of my to do list. Running a bilge pump at regular intervals on a standard timer doesn’t damage the pump. I’ve been using this setup for 7 years with no problems. For your suggested setup, a standard timer won’t work because you can’t trigger it with the float switch. You’d need an interval-on timer. Also float switches aren’t always reliable. There’s just no good reason to over-complicate things.